Precise voltage measurement with the Arduino board. The Arduino range of microcontrollers provides analog inputs that can be used to measure voltage. We can use this to build a voltmeter. This leads us to believe that a reading of 0 corresponds to an input of 0.000V; and 1023 corresponds to an input voltage of exactly 5.000 volts. This is not entirely true. Lets look at the data sheet and see what it tells us. The Arduino microcontroller is provided with a successive approximation type Analog to Digital converter (ADC) which has the following specification. References shown in brackets thus (2: 26.1) refer to sections of the AtMega 2560 data sheet. So the worst case accuracy of the converter is 4 / 1024 or 1 part in 256 i.e. 0.25%. However the limit of the measurement accuracy depends on the voltage reference used. EXTERNAL: the voltage applied to the AREF pin (0 to 5V only). The accuracy of the reference against which the voltage is measured - using any of the above references - is at best only 5.25 - 5.0/5.0 * 100 = 5% - much worse than the 0.25%. the ADC provides. Clearly if we wish to measure voltages to the accuracy provided by the Arduino the on-chip references are not good enough. The diagram below shows these errors as compared to a 4.096v reference described below. 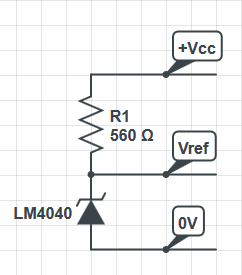 The LM4040DIZ-4.1/NOPB (5) is a voltage reference diode, and if we connect this to the "5V" supply through a resistor, so that a current of >100 uA and <15mA flows through the diode, it provides a voltage of 4.096V ± 0.2%. If the minimum diode current is 0.4mA then It = 0.4 + 0.128 = 0.528mA. The minimum voltage from a USB port is 4.4V so R = 4.40 - 4.096 / 0.528 = 560 ohms. As an alternative the MCP1541 will provide the same 4.096V voltage reference, while the MCP1525 will give a 2.50V reference, and require a resistor of about 3k3. N.B. In all cases the Vref terminal of the voltage reference should be decoupled to ground via a capacitor of 1uF across the regulator IC pins.